The name comes from a corruption of the French elle va ("she goes"). Elva was a racing and sports-racing car manufacturer originally based in Bexhill-on-Sea, in the county of East Sussex UK. The name comes from a corruption of the French elle va ("she goes"). While the founder Frank G. Nichols had been involved in the motor trade during the difficult times which followed from the Second World War, he went on to become a prominent figure alongside such well known personalities as Colin Chapman, John Cooper, Eric Broadly and others on both sides of the Altantic. Having built up a successful garage business in Bexhill, Frank Nichols ventured into motorsports and from this the first Elva sports racing car was produced. The prototype was competitive and onlookers requested that further cars be built which would lead to upgraded models being produced during the period 1955 to the late 1960's. The total was just over one thousand vehicles overall. The original car had used modified Standard 8/10 front suspension with a Ford Prefect rear axle, however the important ingredient was the cylinder head conversion developed by Mac Witts at the Elva Engineering workshop which doubled the power output of the Ford 1172cc side valve engine. This conversion gave the advantage of overhead inlet valves with a crossflow design and proved to be a very popular 'must have' modification for many owners of other vehicles powered by the Ford side-valve unit. Many trophies were won as the model designs progressed and soon the engine of choice became the Coventry Climax FWA. The cars were now being built in two workshops in Bexhill, the designs continually being improved so that by 1958 the Mk.IV was announced with all independent suspension and rear inboard drum brakes. The Mk.V was the last of the front engined sports racers, before the engine swapped places in the even more successful Mk.VI. Meanwhile, Elva Engineering had designed and built cars for the new Formula Junior series, becoming the first manufacturer to produce these front-engined open wheel cars in volume, and again achieved many wins and trophies. The cars used various engines but mostly the Rytune modified A35 units while others had tuned DKW two-stroke power. Elva produced two versions of a rear-engined Formula Junior but by 1960 the series was over taken by cars entered by F1 teams and driven by their star drivers. However, by then the Elva Courier had been built as a road-going two seater sports car, mostly destined for the American market, and with business booming a new purpose built factory was desperately needed. A suitable site was found in Hastings and with the support of Esso, who wanted a fuel station in that area, the large factory premises was built and all production moved there in May 1959. 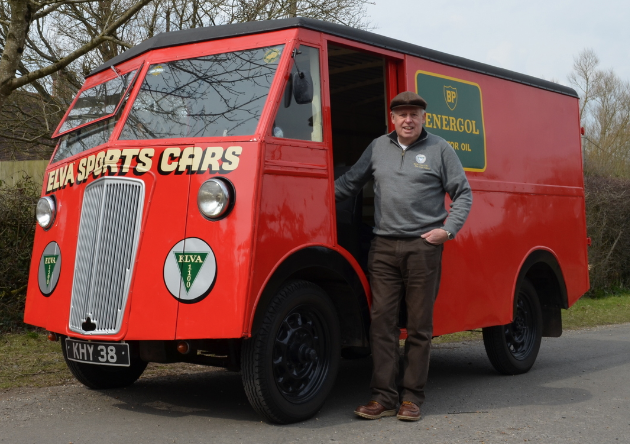 The Courier was first seen in 1958 but was continually developed during its production. Intended as a fun road sports car, the excellent neutral handling soon attracted attention and many were (and still are) raced worldwide. The early cars used a 1498cc MGA engine in a round tube ladder chassis with lightweight 2 seater open glass fibre bodywork and a 'V' windscreen, however this was soon replaced with a one piece curved glass screen alongside a number of other improvements including the larger 1588cc MGA engine. Approximately 400 were made overall. Most cars were exported, but those that were sold in the UK were supplied as 'kits' to avoid the addition of a not insignificant extra 'purchase tax'. In reality the cars were effectively 'fully built', but partly dismantled before delivery; the car could be ready for the road within a couple of days assuming the help of a strong friend! With all this success there was a disaster on the horizon when a batch of cars sent to the States were not paid for, due to the skullduggery of one particular US dealer. As a result Elva Cars was forced into voluntary liquidation and the Courier production was sold to the Trojan Group, while the reformed Elva Cars (1961) company continued to produce the best of the sports racing cars in nearby Rye. Following from the Trojan-Elva acquisition of the Courier, a Mk.III was introduced in 1962 using the same bodyshell but on a redesigned square section chassis frame. The intention was to build the cars on a production line basis, and reduce time and costs by utilising off-the-shelf items such as the complete Triumph Herald front suspension with rack and pinion steering. Power now came from the 1622cc MGA units although the 1798cc MGB soon made an appearance. Nearly all the cars were roadsters but two versions of the coupe body style were available with either a reverse slope (Ford Anglia type) rear screen or a GT fastback. Soon a Mk.IV Courier made an appearance, with new restyled bodywork and arguably more 'creature comforts' such as windup windows, heater etc. Engines were at customers request, to now include the Ford '1500GT' unit. The first of these cars were fitted with the normal beam rear axle but soon the Mk.IV T-Type (Tru-Trak) gave the cars all independent suspension. Trojan had finally taken overall control of Elva during 1964. The directors were not interested in producing a race version of the Courier, but were persuaded to offer the Sebring model which did go some way towards a competitive track car with various changes including a lightweight chassis and body, plus the option of the Lotus/Ford Twin-cam engine. It was too little too late and production of the Courier had ceased by early 1966, in part due to the Agreement with the Bruce McLaren Motor Racing Team to build the McLaren-Elva big-bore CanAm sports racers. Trojan-Elva had built a further 210 Couriers in total. There was one final version built in 1969 by Tony Ellis who had supplied parts and servicing to Courier owners, when he remodelled the GT fastback coupe bodywork, redesigned the car to accept a Ford V6 engine and renamed it as the Cougar. It was an excellent car but there was no money available to put it into production, and so the Courier curtain dropped. Not quite for the last time as Elva Racing produced a replica 'Hastings' type Courier which attracted much attention, and potential orders, but the late 1980's recession in the UK intervened. The busy workshop at Rye had been producing the later sports racing cars, from the Mk.VI to the Mk.VII and Mk.VIII variants, through to the McLaren-Elva series. Engines used included Porsche, BMW, Buick V8 and Chevy V8. A star of the 1964 motor shows in London and Turin was the ELVA-BMW GT160 coupe but due to the cost of production and changes to the GT racing regulations, did not get beyond production of the three prototypes. It used a BMW dry sump engine of 2 litre capacity tuned by Nerus Engineering, with bodywork styled by Englishman Trevor Frost, known as Trevor Fiore, and who also designed the Trident. The rather too heavy aluminium bodywork was manufactured by Fissore in Turin and the cars were completed at Rye. The GT160 weighed under 11 cwt with 185 bhp and so had an impressive performance with one car running at Le Mans in 1965 and another far more recently astounding everyone at a Le Mans Classic event by beating many of the big V8 engined Cobras etc., finishing third overall. The McLaren customer cars were all built to the specifications set out by the Bruce McLaren team, carried an Elva Cars (1961) chassis plate and were sold as McLaren-Elva. These cars were initially built at Rye until production was transferred to the Trojan Group premises in Croydon. The cars were, and remain, hugely successful. The tragic loss of Bruce McLaren whilst testing at Goodwood brought about changes and gently the Elva name was allowed to fade until revived nearly forty years ago by Elva Racing based near Arundel. Trojan went on to compete in F1. Many well known drivers have driven cars built by Elva, particularly in the USA, Europe and of course in the UK. Sir Stirling Moss wrote the Forward to the award winning Elva book. The current owner Roger Dunbar is working to return the ELVA brand as a low volume performance competition car manufacturer. There is a prototype vehicle currently in production as at March 2018, with tests anticipated during April/May 2018. As a footnote, there was another Elva car company that lasted for just one year, 1907, and was based in Paris, France.